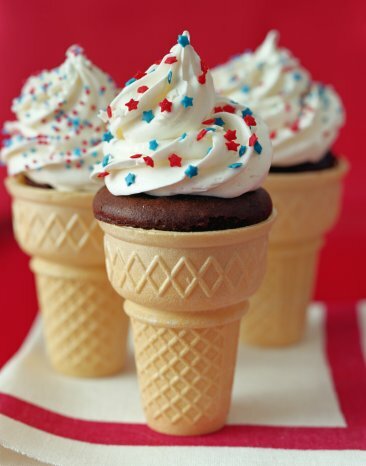 Make unique cupcakes that look like ice cream cones for your Independence Day/Summer celebrations! 1. Prepare cupcakes as directed on recipe. Pre-heat oven as directed. 2. Pour batter into standard muffin pan without liners (grease pan well before filling). Fill each cup 2/3 full. Bake as directed. 3. Let cupcakes cool on wire rack. 4. Place ice cream cones on a flat surface (it is a good idea to place them on what you are planning on serving them on or transporting them in, to reduce the number of times you have to move the cupcakes around). 5. Place each un-frosted cupcake into the opening of the ice cream cone. If opening is not big enough, carefully squish the sides of the cupcake to let it fall into place OR shave off part of the sides of the cupcake in order for it to fit inside. 6. Frost cupcakes as desired. Sprinkle with Patriotic Star Quins. TIP: You can also bake the cupcakes directly in the ice cream cones, however, you will need to wrap the edges of each cone with foil to prevent any burning. Another fun treat idea for Independence Day , patriotic snow cone cupcakes from Bakerella.com! Follow the link for great images and the recipe! And while you are at it take a look around at all her great baking ideas & inspiration! This entry was posted in All Things Baking, Baking Inspiration, Cupcake Recipes & Ideas, Instructions & How-To's, Recipes & Tips, Summer Fun Baking and tagged bakerella, ice cream cone cupcakes, independence day baking, independence day cupcakes by Fancy Flours. Bookmark the permalink.